We were contacted by an executive assistant of Applebee's Services, Inc. in Kansas City, MO to create four distinct awards for Applebee’s Honors program. After several meetings via email and phone conferences where we discussed the purpose of each award, MK Shannon suggested awards that were available in her present collection that could be customized to fit the needs expressed by Applebee’s. A model of a stylized apple was created by MK Shannon to replace a globe held by two figures in an existing MK Shannon award. The Applebee’s logo was mounted on the Apple. This customization option vs. designing a commissioned award saved Applebee’s the cost of designing, modeling, and molding a new award. 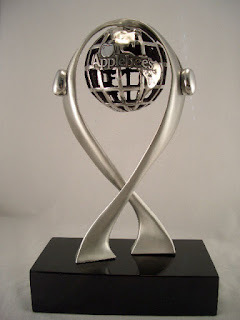 It still provided them with an award that is unique to Applebee’s and is used as their Operator of the Year award. All four of the awards were created by using an existing award and customizing it for Applebee's Honors program. 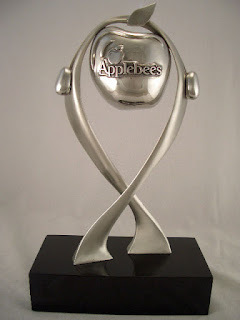 The Heart of Applebee's uses an award which was customized by using a heart shaped piece with Applebee's logo held in the circled arms of a person. The Neighbor of the Year is an award holding a house. And the Franchisee of the Year award uses a globe with Applebee's logo. “One of the most important aspects of this project,” says MK, “is that the client allowed ample time for discussion and development of the awards. We normally require at least two weeks development time and then four additional weeks for casting, finishing, and shipping the awards. Because Applebee’s “planned ahead” there was adequate time for development and all parties were satisfied with the results that ensued. The Heart of Applebee’s award (approximately 15” tall) recognizes the Applebee’s Franchise organization that has shown the greatest commitment to an individual cause or organization. 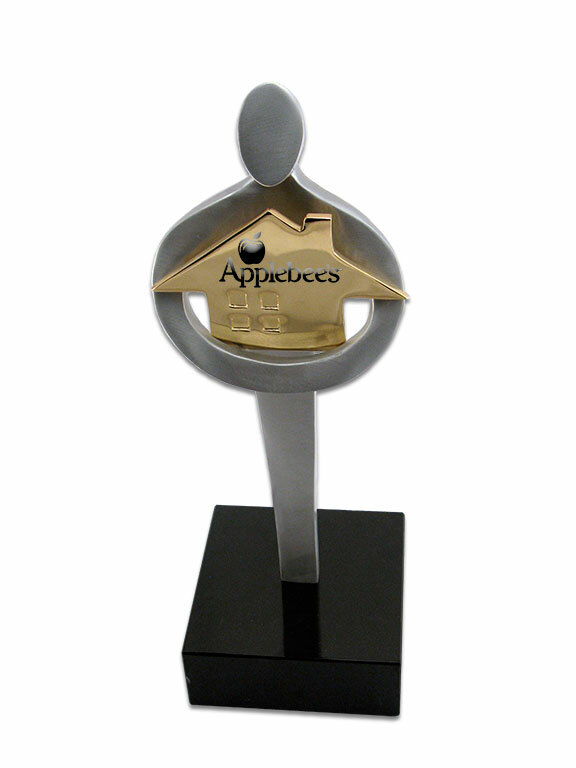 This award (approximately 15” tall) recognizes the Applebee’s Franchise that has demonstrated the greatest commitment to serving its neighbors and neighborhood through a variety of methods and causes throughout the past year. Each year Applebee’s Services, Inc. awards a senior operator within a franchise organization the honor of Operator of the Year. This award is approximately 13” tall. Each year Applebee’s Services, Inc. awards a franchisee with its highest honor by naming them the Abe Gustin Franchisee of the Year. This honor is awarded to a principal shareholder that has made great contributions to the Applebee’s system. The award is approximately 13” tall. 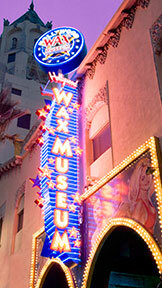 The Hollywood Wax Museum, located on Hollywood Boulevard along the Hollywood Walk of Fame in Los Angeles, California, is the longest running wax museum in the history of the United States, with more than 48 years of continuous operation by the same owners since 1965. In the fall of 2012, for their new Waxy Awards program, they commissioned MK Shannon to interpret and copy their company's highly-recognized outdoor display sign (shown here). This design is very complex and required several days work to construct as a model for final approval by the owner (see mockup in black and white). The original artwork had to be redrawn to make it suitable for model making and casting. Aileen Stein, Director of Corporate Communications for Kuvera Partners Inc., was tireless in her efforts to co-ordinate this project quickly and efficiently, assisting MK at every turn and providing excellent support. This project could not have succeeded without her. Once the designs to be modeled and cast were approved, MK constructed the model, worked with the mold-maker, and oversaw final assembly of the cast parts. Five awards were completed and plated in Sterling Silver for the first Waxy Awards event at the new Hollywood Wax Museum in Pigeon Forge, Tennessee (see photo of final Waxy Award). Within four weeks and a lot of phone calls, emails, and hard work, the awards were completed and shipped. Aileen's comments say it all: "Approved. It's looking great. Please proceed. Thanks so much for your amazing effort!"